Rugged stainless steel housed 1.68” dia. color camera with sapphire lens, 20 LED light ring and high resolution CCD element. A flexible camera spring navigates 3” P-traps. The auto iris adjusts lighting automatically. An impact-resistant polycarbonate light ring cover adds protection. Provides industry standard 512HZ sonde. Features a 5.4” LCD monitor with AR film for optimal viewing in sunlight encased in an anodized aluminum housing mounted to the reel. Protected by an acrylic, anti-glare monitor shield. Video output jack for recording option. Rugged and portable powder-coated steel frame with a secure-locking reel brake. Standard with 125 ft. of Kevlar braided 1/2″ diameter push rod. Camera option: .875” dia. 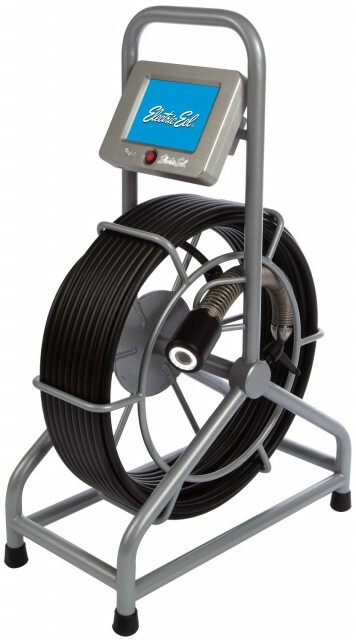 color camera for inspecting 1-1/2″ to 3” lines; negotiates 2” plastic P-traps and 1-1/2″ 90° bends.